Chocolate mousse was invented in heaven. I mean, can you imagine something more lavish and seductive than this foamy delight? Its light and airy texture comes from the bubbles incorporated. The name ‘mousse’ itself means ‘foam’ in French, so chocolate mousse would translate into ‘foamy chocolate’. I am in love! 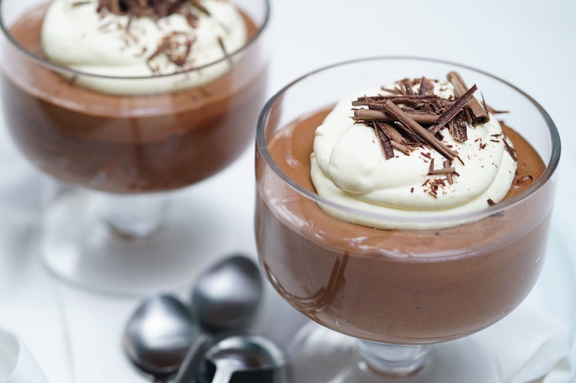 However, chocolate mousse recipes can yield very thick and creamy products as well. It all depends on the method of preparation. My favorite feature of this dessert is the speed and simplicity of preparation. No cooking, no fuss, an easy chocolate mousse recipe is done in only 10 minutes and ready to devour. – Egg whites, whipped into a foam and added to the melted chocolate to provide the foamy and airy texture. – Sugar is usually added to make the mousse sweeter, especially if the chocolate used in the recipe is dark since it is a bit bitter in taste. – Egg yolks are used to enrich the mousse additionally. Alternatively, butter can be used, but why not use up the yolks left after you’ve used the egg whites? – Heavy cream is sometimes used instead of egg whites to make this dessert much lighter and softer. Similar to sugar, cream is recommended in recipes that call for dark chocolate, to give the dessert a more milk-chocolate-like taste. 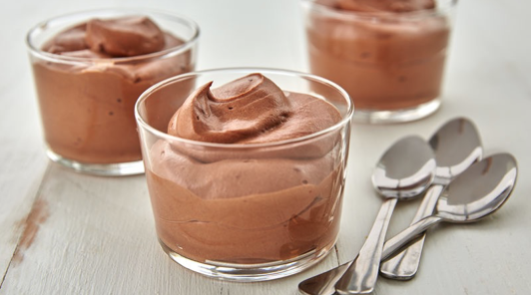 Chocolate mousse recipes can be taken to an even higher level with the introduction of numerous flavorings like vanilla, coffee, caramel, or orange. It might be a little further from the basic chocolate mousse, but who cares, what matters is to enjoy it! Even though this chocolatey dessert is utterly delicious even in its most basic form, there is no harm in using simple garnishes to make it even better! Chocolate in the form of flakes, chips, or sticks, whipped cream, strawberries, raspberries, and, sometimes mint leaves are most commonly used chocolate mousse toppings. In a bowl, combine the chopped chocolate and the butter. Heat in the microwave until melted, for about half a minute. Whisk the egg yolks and add them to the mixture, then set aside to cool. Pour the heavy cream into a mixer bowl and beat on medium speed until it starts to thicken. Add the vanilla and sugar and keep beating until you obtain a cream with stiff peaks. Fold this cream into the chocolate mixture after it has cooled. Decorate with the desired garnishes. The mouse can be eaten immediately or chilled.